A limited company has to account for and pay a range of taxes to HMRC. These often include VAT, PAYE (income tax and National Insurance) and Corporation Tax. Individuals in a business be they an employee, director or shareholder must also be aware of their own income tax and National Insurance responsibilities. This guide aims to provide you with a summary of each different tax that may need to be considered by a business or an individual. A tax year runs from 6th Apr to 5th Apr the following year. Pay As You Earn (income tax and National Insurance) and Self Assessment taxation is aligned with the tax year. A company’s financial year is a 12 month period that can start and end in any month and is not aligned with the tax year. Corporation Tax is payable based on the company’s financial year. Corporation tax is a tax for businesses and is calculated based on the taxable profits achieved by the end of the company financial year. The computations are completed and reported to HMRC on a Corporation Tax Return called form CT600 once a year. The payment of Corporation Tax must be made to HMRC within 9 months of the company financial year end. While you have 12 months to file the CT600 form, this form will need to be prepared to calculate your company’s required payment. So it’s prudent to file it within the 9 months deadline. Value Added Tax is a tax that is charged by businesses for taxable supplies it makes. A business is also likely to pay other businesses VAT when it receives services. This tax is collected and paid by each VAT registered business during its trading activities. The VAT period for a business is not aligned with a company financial year nor related to a tax year. It is independent and is usually processed quarterly. Every 3 months (a VAT quarter) a VAT registered business must submit to HMRC a VAT return. On this return, it is reported to HMRC what VAT has occurred for that VAT quarter, and the balance due to HMRC for VAT. VAT returns must be filed and payments made to HMRC within approximately 5 weeks after the VAT period has end. From 1st April 2019, VAT returns will be filed through HMRC’s new Making Tax Digital initiative. 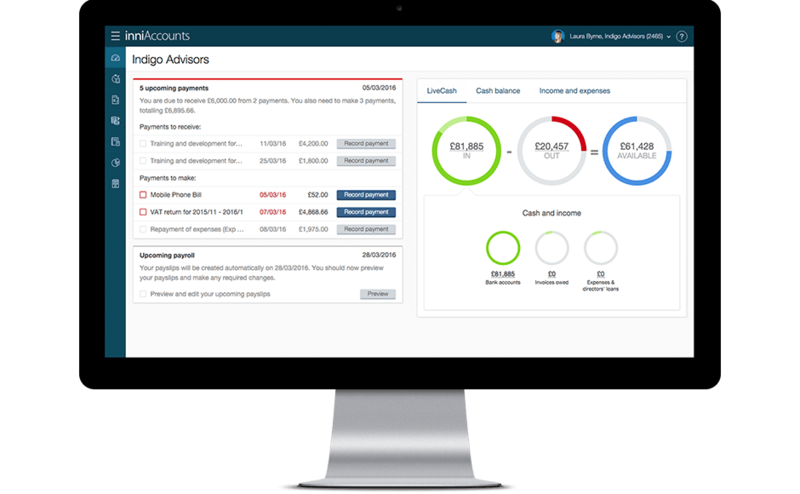 If you’re already an inniAccounts customer, you’re already MTD-ready and you don’t need to take any action. If not, here’s what you need to know about MTD and your accounts. A company that has employees (persons that are paid a salary) must be registered at HMRC as an Employer. When registered, the company will receive details of their PAYE scheme from HMRC. PAYE is aligned with the tax year (6th Apr to 5th Apr the following year) and has quarterly periods. A business (employer) with a PAYE scheme is collecting income tax and National Insurance from it’s employees. This is because a business pays its employees salaries with tax and National Insurance deducted. Not only does the business collect income tax and National Insurance from the employees salary, but the business itself must also pay ‘Employer’s National Insurance’. This is included in the quarterly calculation of PAYE taxes and is paid as part of a single payment to HMRC. The information about employees tax and National Insurance is reported to HMRC each time a payslip is issued to an employee using a HMRC system called RTI (Real Time Information). This must be done before the employee can be paid. Each PAYE quarter a business must pay to HMRC the tax and National Insurances it has collected in the period. The payments need to match the amount collected / reported to HMRC via RTI. Self assessment of income tax is related to an individual person and not a business. As self assessment is related to an individual it is therefore aligned with the tax year 6th April to 5th April. Self assessment is where an individual declares all their personal income from all sources for the given tax year. The aim is to determine if any additional tax is due to HMRC or if there have been any overpayments, to arrange a refund. Typically on a Self Assessment Tax Return, a persons earnings from salaries (multiple jobs), dividends, bank interest, rental income, capital gains etc are reported. A Self Assessment Tax Return and the tax payable must arrive with HMRC by the 31st Jan following the end of the tax year being reported. I.e. a tax return for 18/19 reports income for the period 6th April 2018 to 5th Apr 2019. The return must be filed and any additional tax paid by the 31st Jan 2020. If you have a calculated personal tax bill exceeding £1,000 – you will probably need to make payments on account towards your Self Assessment tax bill for the following year. Take a look at our payments on account guide here. If someone in a business enjoys a benefit personally of something the business provides them with (such as a company car, interest free / low interest loan or gym membership) then it must be reported to HMRC using a form called a P11D. The form P11D reports the benefits and facilities provided to the individual by the business. The company must then pay class 1A National Insurance (13.8%) on the cash equivalent of the benefit. In addition, the employee’s tax code will be adjusted and additional income tax will be deducted from the employee’s salary. The P11D, if required, must be submitted to HMRC by the 6th July following the tax year it relates to. The payment must reach HMRC by 19th July.